Now this one I really love. 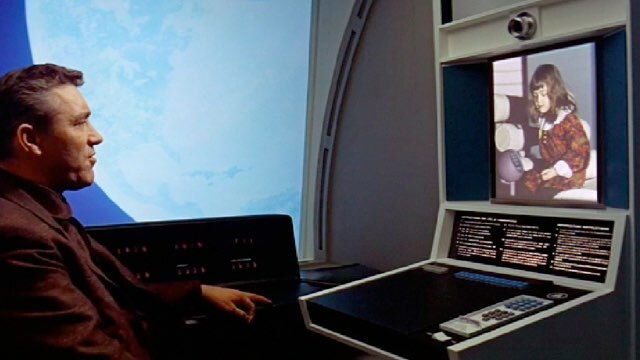 This is from Stanley Kubrick's movie 2001, and it's the scene where Heywood Floyd is on his way to the Moon, which is where the human race encounters the Monolith for the second time in its history, and the Monolith sends a message to Jupiter, and they go on a spaceship, and there's a talking computer, and all of that. But in this bit, Dr Floyd is on a space-station, and he's making a video call to his daughter to wish her happy birthday. This is Kubrick's actual six year old daughter by the way, uncredited. What's lovely about this scene is that it gets the video-call experience exactly right. Floyd is serious, having a conversation. And his daughter is wiggling around, doesn't really care that she's having a phone-call with her dad WHO IS IN SPACE, and acting like this is totally normal. Which totally mirrors my experience Skyping my nieces when I'm in London and they live here, in Australia. I'm chatting and thinking whoa video calls halfway around the planet, future shock, and they're charging round on roller-skates like I've popped over for a cup of tea.